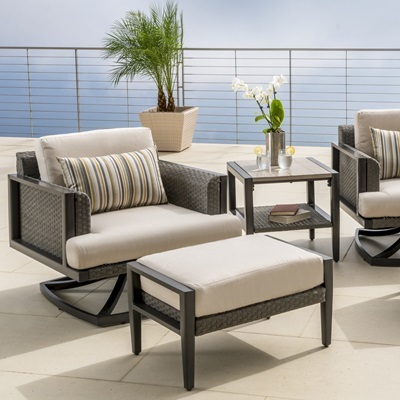 For a mid-century, modern flare to your outdoor living space, pull up the Vistano 5pc Motion Club Chair and Ottoman group is perfect conversation set to relax and lounge in designer style. This elegant, durable, and beautiful set includes two motion club chairs, ottomans and a complimenting two-tiered stone top side table, combining function with signature style. 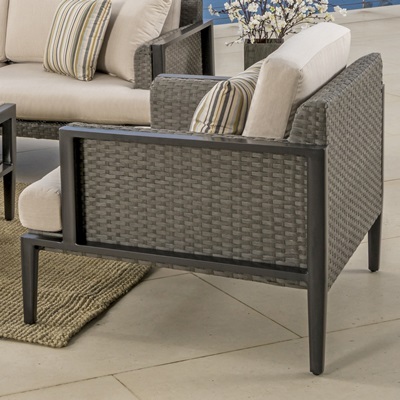 The exclusively designed Vistano Collection features mixed materials, combining geometric patterns with a charcoal powder-coated aluminum frame and woven all-weather Solarfast® resin wicker in weathered Gray. 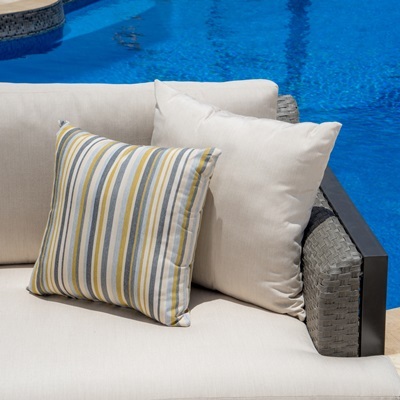 Plush 5-inch, high density, quick drying outdoor cushions are featured in a Canvas Flax Base with six coordinated Catalina Tinsel accent toss pillows with contrast piping. 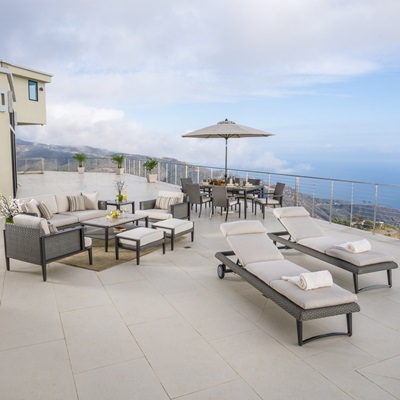 The Vistano Collection uses Sunbrella® engineered fabric, which is constructed from acrylic thread and solution dyed materials specifically designed for outdoor use. Hand-woven, commercial grade SolarFast® all-weather resin wicker specially engineered for rugged outdoor use. Woven over a strong and lightweight powder coated aluminum frame. Unique natural stone top surface in Venetian Gray provides a luxurious designer look. Tables feature woven bottom shelf to use with books, accents, accessories and more. Materials are UV, weather, and color fast fade resistant.